can you can? canning, preserving and "putting up"
it is "last call" at the everyday food & away to garden food fests...we have been at this for 10 weeks (10 weeks!!! )..and will move to sporadic fests instead of a new one each week...the term "last call" reminds me of the way i feel regarding food at the end of each season. 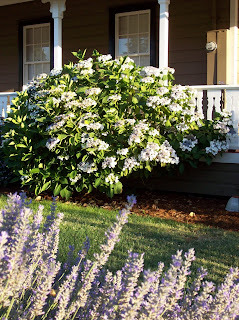 when we bought our farmhouse, it was the first time i had a yard in my adult life. we lived in a condo in southern california when we first got married...and, when we moved to san francisco, we bought a flat and lived there for 15 years. our flat was the entire second floor of a three story building..large and really sunny..tons of light...but no yard to speak of. i have always wanted to garden..so when we moved to napa i immediately took advantage of the opportunity. i now look forward to the process of preserving..there is something really beautiful about walking into the pantry and seeing rows and rows of these amazing jewel colored jars...and i love knowing the origins of each and every ingredient used in the food i feed my family and friends. throughout the year..when each of these items are in season... i will share a number of my recipes on this blog..all the persimmon dishes described above,the many, many, many meyer lemon recipes..including the oft requested meyer lemon marmalade..and the equally popular limoncello. 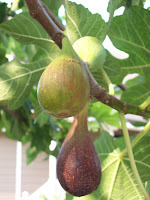 remove stems from figs and discard. chop figs (do not peel) and place in stockpot. add sugar and salt, stir to combine. remove peel from orange using a grater..i use a microplane. (orange part only..no white pith). add orange peel to fruit mixture, stir and let sit for 1 hour(stir every 10 minutes). add orange liqueur and let sit for an additional 1/2 hour. cook over medium heat until they come to a boil. 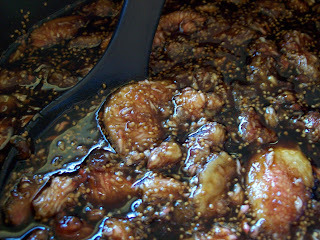 ( stir frequently) reduce the heat and simmer, stirring occasionally until jam thickens (about 35 minutes). 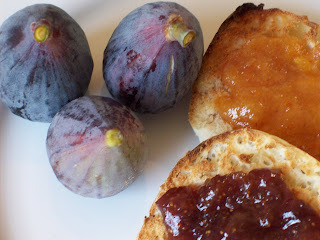 when stirring, use the back of your spoon to mash the figs..you want small pieces of fig in the finished product. 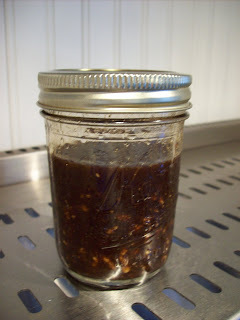 you will know it is ready when you can place a spoonful of the jam on a plate..tilt the plate..and the jam sticks..does not run... transfer the jam to sterilized jars and process if you wish..i do..or keep refrigerated for up to one week. have a good week..and happy october! what does an apple a day keep away? for me, apples keep away the fall blues..i actually love fall..but am not crazy about winter..need sun and warm weather..clearly i was born and raised in southern california..the first few weeks of winter are great..love the snuggling and winter clothes and hot cocoa and the holidays etc..but, to me, it seems like winter lasts forever..and summer passes by in the blink of an eye...o.k., i know..i am way off topic..this post is about apples..but every now and then i need to rant a bit...do you love winter..tell me why? back to apples..last week during the winter squash post i told you about california's indian summer..the day i wrote the post it was a cool 72 degrees..today, the second day of fall, it was 92 degrees...felt like i should be making a full-on summer menu..but it is apple week at the everyday food and away to garden food fests and..since i love apples...decided to prepare and post some summer-into-fall transitional dishes. 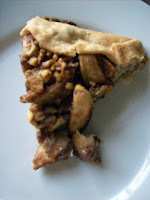 i picked three recipes to feature..a soup, a salad and a dessert...how about roasted apple & caramelized au gratin soup, salad with apples, cheddar cheese & walnuts with balsamic/dijon mustard vinaigrette, and apple crostata with walnuts and dulce de leche sauce? i made the apple crostata yesterday so peter could photograph it for this story..the smell of cooking apples and cinnamon instantly brought back those childhood memories (one day i will write about my grandmother's apple pie..the best ever! )..we had the crostata for dessert..then (don't tell anyone)..we had it again this morning for breakfast...apples rock! 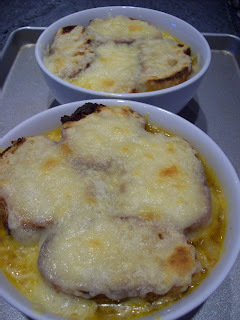 the following soup is my vegetarian version of a classic french onion soup. the roasted apples provide a hint of sweetness, the caramelized onions are rich and buttery and..what can you say about the melted cheese/bread topping but delicious? i use a vegetable stock in place of beef stock, but the butter, olive oil, sherry and other ingredients give the soup amazing flavor and keep it vegetarian. this is one of my favorite soups either as a starter or as the main course for dinner. preheat oven to 375 degrees. place 1 tbsp butter in small roasting pan and place in oven until butter melts. add apples and 1 tbsp olive oil and stir to ensure apples are coated in the butter/olive oil mixture. roast in oven until apples are lightly browned and very tender. (15-20 minutes). while apples are roasting, melt remaining tbsp butter in medium stockpot. add 2 tbsp olive oil and onions and stir to ensure onions are thoroughly coated. cook over medium heat, stirring frequently, until onions are browned and caramelized..about 15 minutes. add apples, stock, water, salt and pepper to stockpot and bring to a boil. lower heat and simmer for 20 minutes. add sherry and cook another 10 minutes. while soup is simmering, toast bread in oven until lightly browned..remove from oven and let cool. set oven to broil..assembly.. fill 4 heat proof/oven proof bowls 3/4 full. place a slice (or slices, depending on how large the pieces are) on top of soup and drizzle with olive oil. sprinkle with cheese to cover soup..and place bowls on a cookie sheet. place in oven and broil until cheese is melted and bubbling..and slightly browned..watch carefully and do not let cheese burn. serve immediately. combine first 5 ingredients in large salad bowl. toss. add approx 1 tbsp of vinaigrette per serving to bowl. toss. 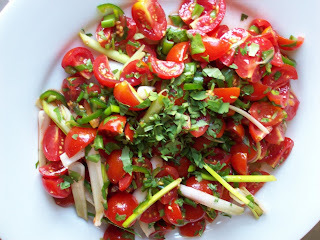 add additional vinaigrette to suit your preference but do not allow salad to get soggy. add salt and pepper to taste and serve immediately. 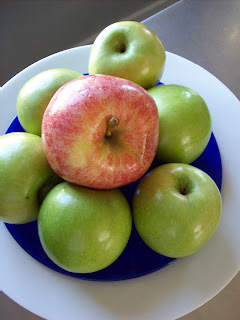 i love this apple crostata recipe. it is not very sweet, so it is perfect after dinner with the rest of your wine. i even have leftover crostata for breakfast the next day..perfect with a latte. 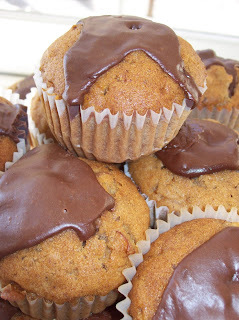 if you prefer a sweeter dessert, increase the sugar by 1/4 cup. preheat oven to 375 degrees. 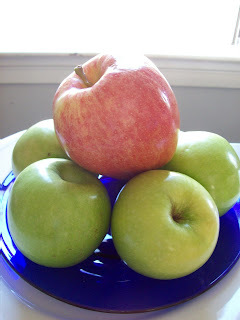 place apples and the next 9 ingredients in a mixing bowl (everything but the butter and dulce de leche) stir to combine. place a silpat sheet or parchment paper on a rimmed cookie sheet. roll one disk of dough to a circle 11 inches in diameter. place dough in center of cookie sheet. spoon apple mixture to center of dough leaving a 1 1/2 inch border. fold sides of dough up and over to cover the dough border. this will keep apple mixture and the juices from spilling out. dot top of apple mixture with butter and bake for 40-45 minutes until dough is golden brown and apples are bubbling. 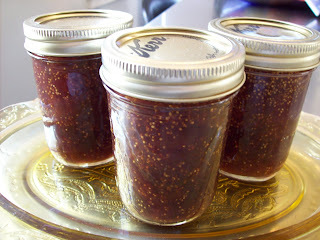 place desired amount of dulce de leche in microwave safe bowl and heat until warm and runny. serve crostata warm or at room temperature drizzled with dulce de leche. "for the crostata crust... put the flour, sugar, and salt in the bowl of a food processor fitted with a steel blade. pulse a few times to combine. add the butter and process until the butter is the size of peas (between 10-15 pulses). with the motor running, add the ice water all at once through the feed tube. keep hitting the pulse button to combine, but stop the machine just before the dough comes together. turn the dough out onto a well-floured board, roll it into a ball, cut in half, and form into 2 flat disks. wrap the disks in plastic and refrigerate for at least an hour. if you only need one dough, freeze the second disk." instructions from the barefoot contessa..
enjoy these apple recipes..and please share your favorites in the comments section of this post. am i an "experienced" blogger?? when i started blogging earlier this year, i had absolutely no idea what i was doing. i knew i wanted to write about my post corporate life, but website design, hosting, html code etc were foreign concepts...i am by no means a "techie". i did a bit of research and found out there were a number of blog hosting companies that allowed a sort of "plug and play" concept. i actually launched the blog in an afternoon..
i began to research everything possible about blogging..how to promote, market, link, and share my blog. i discovered a ton of helpful sites that provided tips, help and advice. i began to explore social networking sites in earnest..and have met many fellow bloggers.. the professional ones who do this for a living..and, without fail, have found this community to be selfless in their willingness to teach a "newbie" the ropes. i learned a lot..but spent a ton of time with my research. throughout my learning process i kept wishing there was someone or someplace that i could get tips, advice, feedback and be able to ask questions..a one stop resource..it would have made the first 6 months of blogging so much easier. so here goes...a three month mentorship. i am really looking forward to this..and i will post updates to my blog regarding what we learn. i would love to have all of you help us out...if you have a blog now, please share any learnings, tips or experiences you have had...if you don't currently blog..but have always wanted to..what questions would you like answered to help you get started? please share your thoughts, ideas, suggestions or feedback in the comments section of this post...and thanks in advance for helping us out. 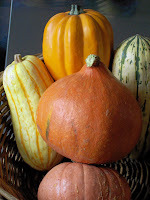 is it time for winter squash yet? the start of fall is always interesting in california. the weather at the end of august/early september is usually pretty hot..then, overnight it seems, there is a change and we have foggy mornings, cool afternoons and chilly nights...all the foodie magazines are touting hearty fall dishes, halloween decorations and autumn harvest produce. then..just as i start thinking about sweaters and jackets after a summer of tank tops and flip flops...we get "indian summer". for a couple of weeks the weather turns really hot again and it feels like summer...you would think that as a native californian i would be used to this phenomenon..but every year the weather fakes me out. today in napa, it is overcast and foggy. they say it will get to 70 degrees by this afternoon..not sure i believe it. 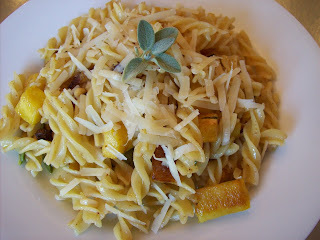 so, my thoughts turn to fall dishes..something warm and cozy..something like winter squash. 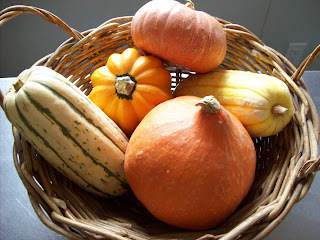 happily, it is squash week at the everyday food and away to garden blogs...perfect timing. some people are going to use summer squash..but since it feels like fall..i am going with fall dishes...and, since i love winter squash, the timing is perfect. i was at the market yesterday..and filled up a basket with a beautiful looking assortment of acorn, delicata and red kuri squash... a woman came up to me and said.."oh, what a beautiful display..are you using that for your fall decorations?" i told her..no..and said i was cooking them for a blog story on winter squash...she immediately asked for the blog address and confided that she bought squash every year..displayed it throughout her home during fall..and then threw it away because she had no idea how to use it! no, no, no..winter squash is beautiful..but it is also really easy to cook..extremely versatile..and good for you due to the high fiber, beta-carotene, vitamin a and vitamin c content...most importantly to me though..winter squash is absolutely delicious. the chili recipe below is perfect for a cool, fall day. i serve it with a big salad and either corn bread or corn/flour tortillas...i do not think it needs anything else. place dried beans in large stockpot and cover with water. soak overnight. in the morning, add olive oil to a large slow-cooker. 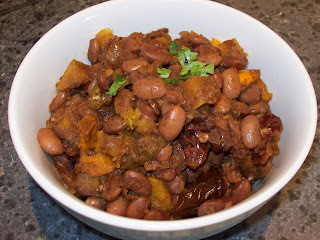 drain beans and add to slow cooker. add remaining ingredients in the order listed. stir gently to combine all items. cook on low for 8-10 hours, or on high for 5-6 hours. taste and adjust seasonings..it will probably need additional salt. *note, my husband, peter, sometimes asks for a heartier version. he loves this chili with buffalo meat. i season cubes of the buffalo with salt and pepper then brown in a skillet with olive oil. add to rest of ingredients at beginning of recipe, stir and then follow the directions above. preheat oven to 375 degrees. place squash and onion on baking sheet. drizzle with olive oil, sprinkle the cinnamon, nutmeg, salt and pepper over the vegetables and, using your hands, mix together to ensure everything is evenly coated. roast in oven until vegetables are tender and beginning to caramelize..about 20 minutes. remove from oven and place in serving bowl. 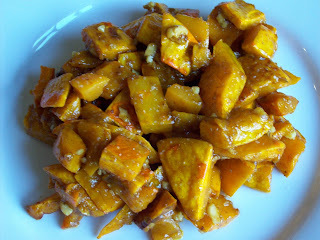 top with honey, walnuts and balsamic vinegar..stir and serve..
please do share your favorite squash recipes in the comments section of this post..and don't forget to check out the everyday food and away to garden blogs for additional recipes and gardening tips if you want to grow your own winter squash. "how about cornmeal pancakes with fresh blueberries?" for the past two sundays we have had friends over for brunch..different people each time..but very good friends nevertheless. 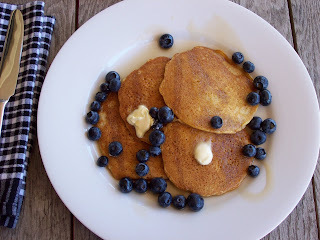 both weeks i planned a tentative menu and created my shopping list only to get a phone call from said friends asking what was on the menu..as soon as i told them what i was thinking, there was a brief pause..and then this question.."how about cornmeal pancakes with fresh blueberries?" i mean really..two weeks in a row..i started thinking about favorite recipes..and friends who felt comfortable enough to ask for their favorites..i went from being a bit put out by not being able to try something new..to very happy and pleased that i have a large collection of dishes that people enjoy and request prior to coming to my home. not all the time(sometimes i can do the "new" recipes)..but often enough. to me, my favorite times..and my favorite memories..are those spent with family and friends around the dinner table... eating, laughing, talking, telling stories, continuing traditions or creating new ones...and knowing the food will be thoroughly enjoyed adds to the feeling of contentment..
so, for today's post, i thought i would share this recipe with you. maybe these pancakes will be added to your collection..and shared with your family and friends..i hope they will become a favorite in your home too. 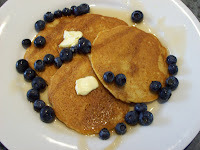 i have made these cornmeal pancakes for years..i like them because they are not too sweet, taste really good..and offer a bit of a difference from more traditional pancakes. they are also really easy which is always a plus for me when having guests for brunch..not tons of work first thing in the morning. what are your most requested recipes? do you have "go to" dishes that you use whenever you want to make something delicious..and not experiment with something new? if so, please share the recipes with all of us in the comments section of this post..thanks in advance. o.k...so i can hear the questions.."what about the weekly food fests?" this week is a recap week as we transition from summer produce to fall produce. be sure to check the everyday food blog and the away to garden blog on thursday for one last look at some of the favorite recipes shared during the past few weeks. 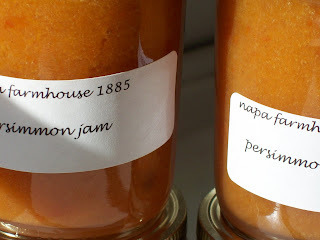 i thought we would join in with an overview of the napa farmhouse 1885™ offerings. week one for us was cukes & zukes. 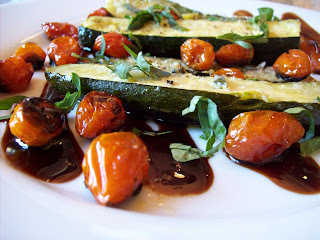 check out this post for roasted zucchini and tomatoes with parmesan and balsamic reduction and zucchini/potato hash browns with cheese. week two brought us green bean week..spicy green beans in asian chili sauce and green bean & potato salad with feta. 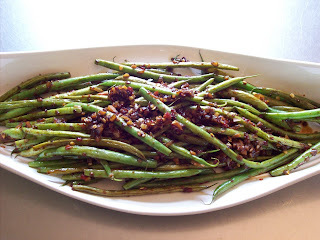 how about roasted green beans, tomatoes & garlic with balsamic drizzle? 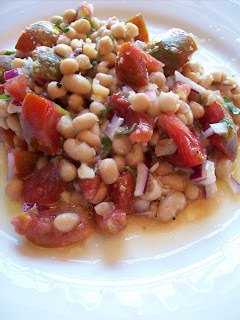 week three was my favorite fest..because it was fresh tomatoes..i love tomatoes and wait all year for them to be ready..this post covered easy, breezy "non" recipes like fresh tomato sandwiches and roasted tomato pasta..then i shared my heirloom tomato & white bean salad, fresh pico di gallo, and heirloom tomato tapenade with bruschetta..
week four was all about fresh corn... the everyday food blog listed numerous delicious sounding recipes..but i shared my love of corn on the cob..and admitted that i never make any of the delicious sounding recipes..rather i always succumb to corn on the cob..boiled, roasted or grilled..with simple but very flavorful toppings. 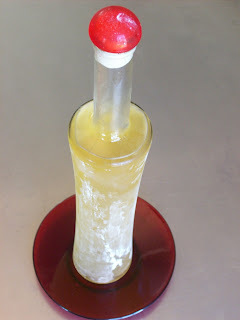 this post also includes what has been described as the most unusual but amazingly good corn recipe..my family's corny, corny lena (read the post for explanation of the name). 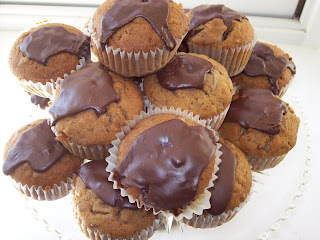 corny, corny lena is actually a dark chocolate and pureed corn cake..with chocolate glaze. unusual..yes..and really, really good..
so what do you do with 30 pounds of pears? so again, what do you do with 30 pounds of pears..two days before the labor day holiday..when you have friends scheduled to visit each day of the weekend..and you have already planned all the menus? if you are like me, you begin adjusting fast..because a gift like this is too amazing to go to waste. 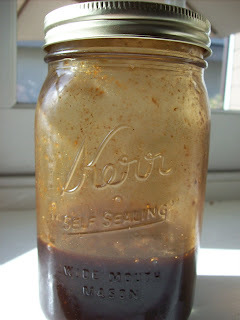 combine all vinaigrette ingredients in a mason jar and shake well. 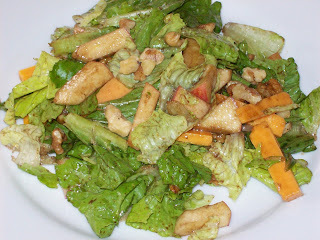 lightly coat salad with dressing..leftover vinaigrette may be kept in the refrigerator..use within a few days for best taste. i spent the weekend experimenting with pear recipes..poached them in wine, grilled them and served with fruit balsamic vinegars, made a pear tart..pear compote..pear cobbler..you name it. 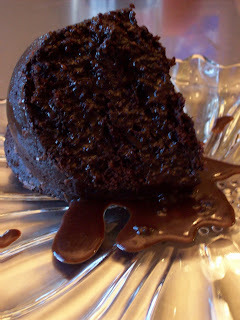 for inspiration i asked my twitter pals for their favorite recipes. now, if you are not familiar with twitter, i describe it as an on-line social network..where you answer the question "what are you doing?" in 140 characters. fellow twitterers sign up to "follow" you..and you sign up to follow people that interest you. one day soon i will write a post about twitter..i find it very interesting..and incredibly educational... the folks i follow are primarily foodies..chefs, food bloggers, home cooks, and people involved in green, eco-friendly lifestyles. they are an extremely knowledgeable bunch of people..and very, very generous with their help, tips and advice. 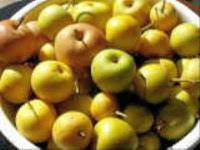 suggestions for my pears came pouring in..i have so many recipes to try i can write another pear story..pear vinegar, pear brandy, roasted pears, pear appetizers..you name it... my absolute favorite came from @davina. she lives in italy and has sent me a number of delicious sounding recipes. her pear idea is for raviolis filled with sheep ricotta, grated parmesan, a bit of brie and tiny cubes of peeled pears... the raviolis are served topped with dots of butter and a parmesan cheese sauce...how great does that sound?? i plan to make this dish soon and promise to post the actual recipe once i figure it out..she just sent me the ingredients. for those of you on twitter, i invite you to follow me. ..and check out the people i follow..they are terrific..
now..after planting a pear tree this weekend (!! )..and experimenting with countless pear recipes..i realized that it is fruit week at the food fests for everyday food and away to garden..how timely is that? 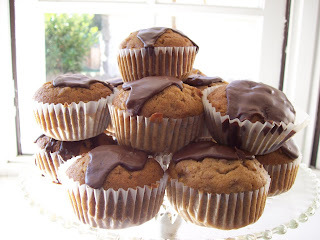 i decided to post the recipe that garnered the most raves this weekend.... i love combining pears with chocolate..so i created a recipe for spiced pear cupcakes with a chocolate glaze...this is the kind of recipe that..based on the quantity eaten..you know is a hit... friends and family ate multiple cupcakes..and asked for more to take home...yes..i baked a lot this weekend..but it was so worth it..give the cupcakes a try..and please let me know what you think...and don't forget to check out the everyday food and away to garden blogs this week for tons of terrific fruit recipes..
preheat oven to 350 degrees. spray cupcake pan with cooking spray..add paper cupcake liners and spray again. so..one last time..what do you do with 30 pounds of pears..and more on their way? 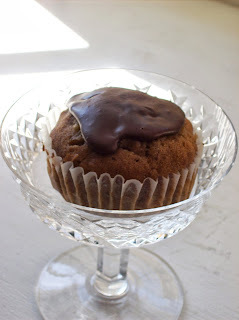 happily..i love the process of figuring out the answer to the question..but i could use your help..please add your favorite pear recipes to the comments section of this post...i will keep adding additional recipes too...so check back often..